Iqdam, Qadam : Step : any maneuver made as part of progress toward a goal. "Now move on to the next step"
Chalna : Walk : the act of traveling by foot. "Walking is a healthy form of exercise"
Chalnay Ka Amal, Chehel Qadmi : Walk : the act of walking somewhere. "I walked to the end of the street"
Chaal : Step : the act of changing location by raising the foot and setting it down. "He walked with unsteady steps"
Shuba, Pesha : Walk : careers in general. "It happens in all walks of life"
How this page explains Lambay Lambay Qadam Utha Kar Chalna ? 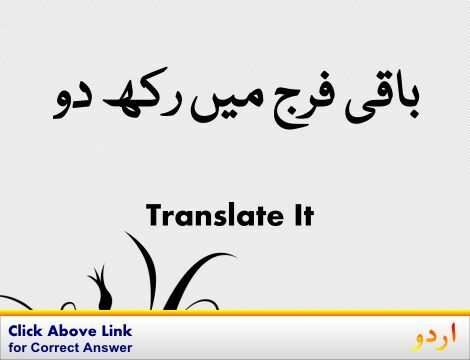 We help you understand the word Lambay Lambay Qadam Utha Kar Chalna in English. We not only provide English meaning of لمبے لمبے قدم اُٹھا کر چلنا but also give extensive definition in English language. You can also find multiple synonyms or similar words along with Lambay Lambay Qadam Utha Kar Chalna. You may also want to see Android app to get لمبے لمبے قدم اُٹھا کر چلنا, please install Wordinn Urdu Android app now.